Preheat oven to 350°F. In a small bowl, stir together crust ingredients until well-combined. Pack crust into the bottom of a 9-inch springform pan. Use a measuring cup to flatten out the crust and pack it in. Bake crust for 10 minutes at 350°F. Then remove and let cool briefly. For cheesecake filling, mix together softened cream cheese and sugar in a mixing bowl. If you have a stand mixer, use the paddle attachment. Or, you can use a hand mixer. Once cream cheese is light and fluffy, stir in vanilla, salt, sour cream, heavy cream, and lemon zest. Mix in eggs, one at a time. Mix filling until it is well-combined. Pour cheesecake filling into the springform pan with the crust. Bake the cheese cake at 325°F for 1 hour 45 minutes, until the cheesecake is just starting to set. After baking, turn off oven and let the cheesecake slowly cool in the oven for one hour. Remove cheesecake from oven and let cool for at least 2-3 hours in the fridge before serving. For blueberry sauce, mix together cornstarch and water in a small bowl. Then add all ingredients to a small sauce pan and bring to a simmer. Simmer sauce for a few minutes until the sauce is thick, but the blueberries are still whole. Remove from heat and let sauce cool. 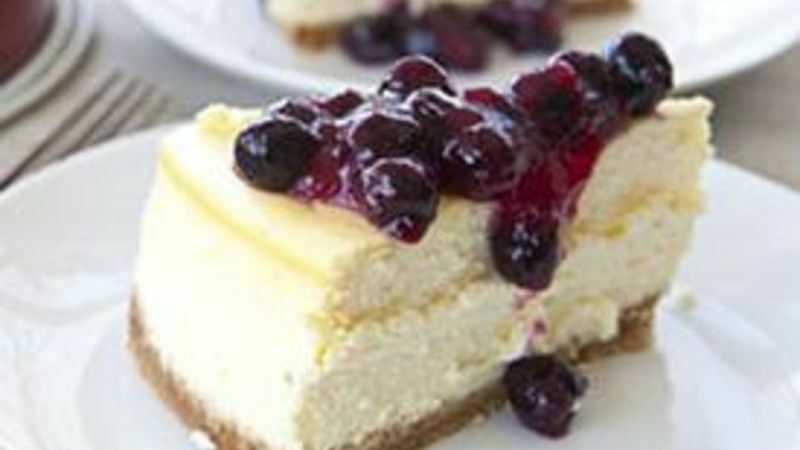 Serve cheesecake with room temperature or slightly warm blueberry sauce. When you need a dessert you can never go wrong with cake, especially when that cake is a light, creamy lemon blueberry cheesecake! If cheesecake from scratch seems daunting, don’t worry, it’s easier than you think. The most important step is to bake the cake in a water bath. Pro tip: Add the water to the baking pan after it’s already in the oven with the cheesecake. Trying to move a pan full of water will most likely result in a messy, wet disaster. And if you’re not sure if your spring form pan is leak-proof, just wrap the bottom of the pan with foil to seal any gaps. You’ll be so happy you made this dreamy cheesecake with luscious blueberry sauce. It’s the perfect dessert for spring and summer or whenever you need to treat yourself to something extra delicious.